I had been looking forward to picking up and reading Winning with Data by Tomasz Tunguz and Frank Bien ever since I first heard about the book on tomtunguz.com. This is my review. If you’re looking to get an initial introduction into data-driven companies or how you might bring data-driven thinking to your company, Winning with Data is for you. For deeper dives, you’ll need to supplement this book with other resources. The book is co-authored by Tomasz Tunguz, a partner at Redpoint Ventures, and Frank Bien, the founder of Looker, a business intelligence tool. Tunguz is known in the SaaS world for his daily, invaluable blog posts published at tomtunguz.com. Every day, Mr. Tunguz breaks down different aspects of the market or running a company in a data-centric way. As Winning with Data purports, an effective culture of data-driven decision-making removes the effects of “management by opinion” in companies. Redpoint Ventures is known in the Valley for taking a very analytical approach to their investments, making sure that founders have a strong understanding of *aaS metrics and how those affect the business. Frank Bien is an industry veteran having held roles at Dell, EMC, and others. He created Looker in 2013. Looker is a business intelligence platform deployed by hundreds of companies worldwide. It helps companies make sense of their data. The book is a quick read at 150 pages. Data. Data. Data! Data is everything and it is nothing. The book focuses on the pieces of information generated by customer actions: how much revenue did we earn on the Acme Co. account this month? How many times did John Appleseed log in last month? When aggregated, the small questions like this allow companies to build robust data engines around their business. These data engines can be both historical and predictive. In many ways, these engines represent the common knowledge of an individual the business. These are the data points that the Data! rallying cry of the book is built around, and they are the most commonly-found sets in startups. What Should Be the Role of Data? By inculcating a common set of values, offering the tools and education, and creating a common language, data teams within these businesses empower their colleagues to decide how to advance the company using data, instead of opinions. The book hinges on a central question: What is the role of data in thriving companies, and how does that give them a competitive advantage? Having personally understood the dangers of bad data and the benefits of good data, this is a critical question for any company no matter the size. Some data points are merely historical, while some can be predictive. It’s in the best interest of companies to start developing data warehouses and data pipelines, even if they are rudimentary. Having picked up a few books written by VCs, it’s sad that some writings are simply an advertisement for their portfolio. This can water down the message of the book, and perhaps make companies selected for case studies seem random. It can be difficult to tap companies outside of your firm’s portfolio, due to competitive reasons or just due to sheer familiarity. Tunguz and Bien do a relatively good job of preventing the book from becoming an advertisement, given the subject matter; the push for the data robustness they advocate for is relatively new. Of the 45+ companies mentioned in the book, only 5 were Redpoint portfolio companies. (Data!) Some of the companies that were studied more closely were not Redpoint portfolio companies, which was also good to see. That being said, a few too many chapters ended with a “And then the company deployed Looker and all data problems were solved.” Looker receives high marks from the companies that use it, but some more variety would help balance the book a bit more. Because Mr. Bien is the CEO of Looker, bringing objectivity to this matter is no easy task. While I enjoyed the book, I was left wanting a bit more depth or case studies into the companies mentioned. There are 45+ companies mentioned in the book’s 150 pages. Some companies are covered more in depth than others, but the book moves at a quick clip. 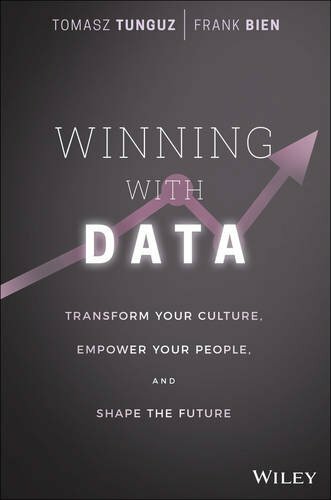 A better title for this book might be, Companies That Have Won with Data or Companies That Are Winning with Data. I would also love to see the sequel: How to Win with Data. In this vein, I actually thought the appendix on “Revenue Metrics” would be most helpful for someone dipping their toes into building a data fabric for their company. Thankfully, a lot of this depth can be found already on tomtunguz.com as well as elsewhere online. As someone that has operated in companies with data droughts, I’m always on the lookout for that beginner’s guide that could have saved my past self. On the whole, Winning with Data is a good read for anyone looking to bring data to the decision-making process of a company today. It illuminates what types of decisions are made easier with the right data, as well as looking at some quick case studies. If you’re a fan of Mr. Tunguz’s blog, some of the book might seem old hat. Nonetheless, it’s worth a skim and worth keeping an eye out for future editions.